Ladybird's First Favourite Tales are fun, gentle introductions to classic fairy tales, suitable for reading to the youngest of children. Packed with rhythm and rhyme, these abridged tales are great to share together again and again. 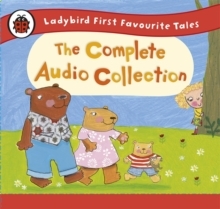 Now, for the first time, all eighteen classic titles in the First Favourite Tales series are available in one audio CD collection. Perfect for use either at home or in the car, each individual track features a fun, rhythmic fairy tale retelling plus beautiful, specially composed music and sound effects to help bring it alive.